New groups graduated and attended a ceremony at the Cable Car Hall in Jericho early September 2007. Certificates were given according to the levels of graduates. Father Khristo Moss handed in financial rewards to all graduates. The Society-with the co-operation of the Nablus Quran Radio transmitting on 96.9FM wave-set up a relay device in Jericho to strengthen its programmes to be received clearly in the Governorate. Furthermore, the Society connected different mosques with the unified Azan-calling to prayer- system, namely Dyuke (Upper and Lower), Auja, Nueimeh and Aqabat Jaber Camp. During the Month of Ramadan, the Society distributed copies of Quran and religious leaflets and brochures in the Governorate of Jericho preaching on Fasting, Prayer, Zakat, Fitr Charities, Grave Torture and the Good Relative and so on. The Society provided some schools with books to distribute to its needy students. This was conducted with the cooperation of parents and school managements. 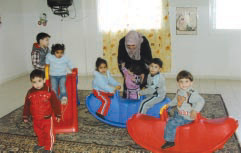 Over 300 orphans were included and were given a variety of religious, cultural, literary, scientific and recreational programmes by camp specialists. 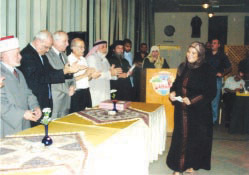 The Society distributed more than 2000 school bags to orphans and needy pupils in the Governorate with the cooperation of several charitable societies and local councils and school managements at the start of the 2007/ 2008 school year. The Society organizes Haj and Omra journeys every year as it did this year. It also arranged for a “ Bon Voyage “ ceremony at the Municipal Theatre of Jericho to explain different “ Manasik”- rituals with the help of special pamphlets. The festival included some religious songs. Steadily the Kindergarten began its ninth year. The new premises were furnished with high quality specifications donated by Father Khristo Moss. It was equipped with computers and teaching aids according to the Ministry of Education‘s specifications as well as air conditions. Specialist teachers were appointed to teach over 100 kids. The end of the year ceremony was administered in May, 2007. The Society opened an ideal nursery within its new premises equipped with special requirements to facilitate comfort for kids under infants day care specialists.